While our Scottsdale nighttime plans frequently involve a craft cocktail spot or dining establishment, for a night out on the town with dinner and a show, we head to Talking Stick Resort, a luxury hotel and casino with an array of entertainment venues, lounges, and restaurants. Our evening always starts at the stunning Orange Sky restaurant located on the 15th floor of the resort, guaranteeing striking 360-degree views of the Valley and Camelback Mountain. It draws its name from the signature vibrant orange sunsets that can be seen from its lofty perch. Executive Chef Ron Dimas’ modern steakhouse menu goes hand in hand with the impressive wine list recognized by Wine Spectator’s Best of Award of Excellence. Pre-concert dining can be reserved on the striking patio with an infinity pool centerpiece, the beautiful dining room with floor to ceiling windows, private rooms with prime views that seat two to four people, or at the bar with its backdrop of the open kitchen. The menu offers just as many options. 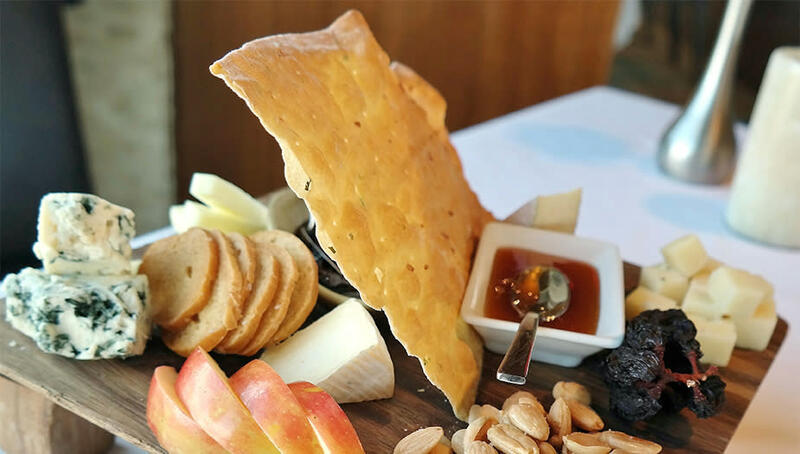 On our visits before a concert, we’ve stopped in for a light bite to share a seafood platter piled high with fresh oysters, lobster, shrimp, and mussels, or grazed on a cheese plate paired with wine from the 30 by-the-glass choices. I’m also drawn to Chef Dimas’ creative flourishes and on our latest visit, we feasted on a multi-course repast with classics such as filet with Béarnaise sauce and lobster risotto, along with sweet potatoes stuffed with local goat cheese, wrapped in pancetta, served on a sizzling rock and drizzled with bourbon-pine syrup, and tender elk loin medallions complemented by a smoky carrot-ancho sauce and wild mushrooms. After dinner, there are a seemingly endless list of options for finishing out the evening. It might be time to head down to the Showroom, where we’ve seen performances by artists such as Los Lobos, Big Bad Voodoo Daddy, and Los Lonely Boys. The venue seats 650 people, including private booths and tables, and hosts entertainers from Dweezil Zappa and Todd Rundgren, to comedians Tracy Morgan and Kathleen Madigan. The resort’s premier concert hall, the Salt River Grand Ballroom, is even larger with a capacity for 1600, and our most recent visit was for the Happy Together Tour with the lead singers from top bands of the ‘60s and ‘70s such as the Turtles and Three Dog Night. Visiting headliners who have also taken the stage include Dwight Yoakam, Smokey Robinson, and Cyndy Lauper. Pool Concerts take advantage of Arizona’s beautiful weather where guests can enjoy a show under the stars or rent a cabana with VIP bottle service. Sold-out events at this outdoor venue have included Alice in Chains, ZZ Top, Foreigner, and renowned DJs. Open Fridays and Saturdays, nightclub Degree 270 on the 14th floor is open until 2 a.m. and a popular spot to end a festive evening (Tip: If your plans are for dinner and dancing, ask about the hidden staircase to Degree 270 from the Orange Sky patio). More often than not, though, we find ourselves back at the Orange Sky Lounge for a post-concert nightcap, especially if Stan Sykes is on the piano. 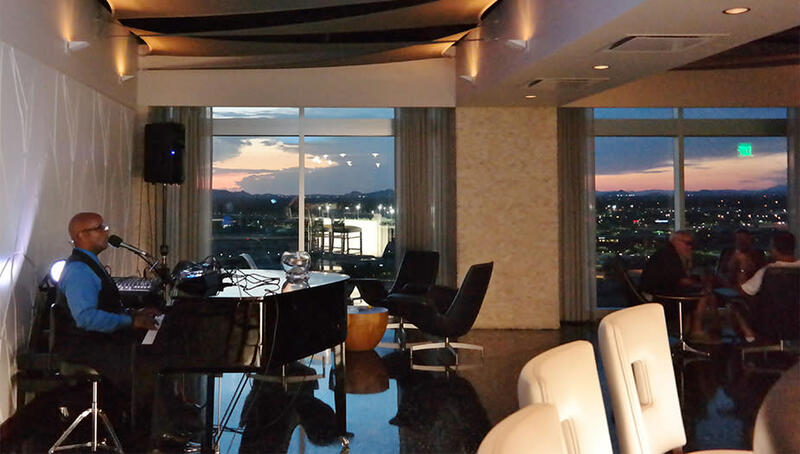 Order a specialty cocktail, sit back, and enjoy the music and city lights view. Looking for a more casual dinner and a show? Plan a visit to the Blue Coyote Café with an eclectic menu from Southwestern to sushi or, my pick, Ocean Trail. Set in the corner of the casino floor, this lively 19-seat seafood restaurant features a New Orleans-inspired menu. Pull up a stool, sip on a Hurricane, and order specialties such as gumbo, crawfish étouffée, or seafood pan roast. Afterwards, enjoy live music in the casino-level Palo Verde Lounge or the Shadows Lounge with a cigar and jazz. Gamblers will find their entertainment too. Try your luck in the sleek 98,000-square-foot casino with 800 slot machines, roulette, Keno, or table games such as Blackjack, Casino War, and Pai Gow Poker. Dining, dancing, concerts, and gambling – choose your experience at the Talking Stick Resort.